Pens: Mitchell #3.5 for the Calligraphy, Pointed for the outline. Inks: Walnut ink for the calligraphy, and Ian the Green's Iron Gall for the outlines. My lovely lady Adrienne was to be recognized with the East's brand-new A&S award, the Silver Brooch. Of course I wanted to do the scroll for her! Luckily, we were both busy with our own projects leading up to the event it was to be awarded, so I was able to be sneaky and get it done without her seeing. I knew I wanted to make something clean that I could execute well in a fairly short period of time. 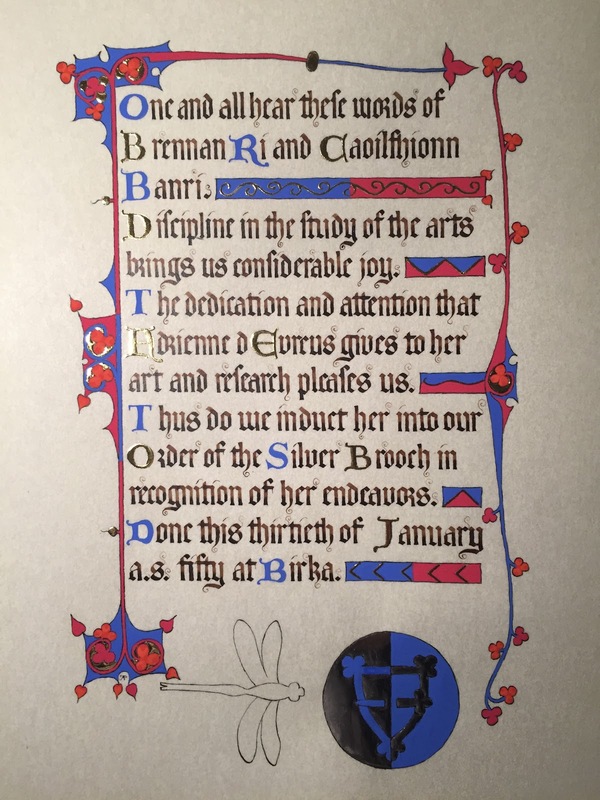 I ended up settling on the Luttrell Psalter as an inspiration as she enjoyed working from it in the past for Deormund's Grand Master Bowman. 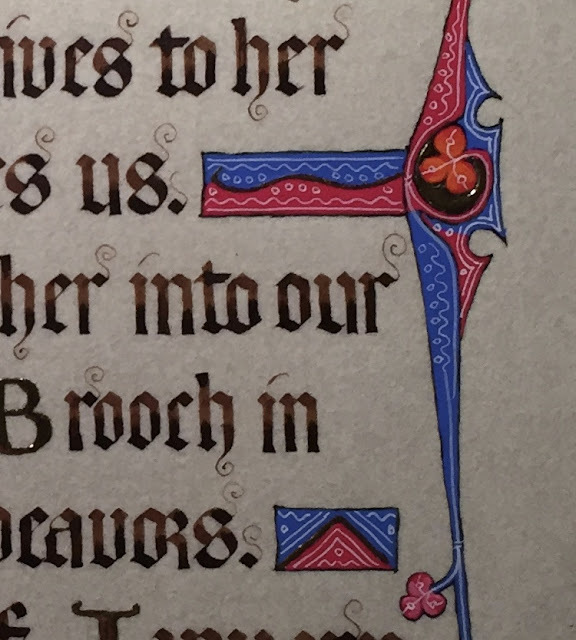 It has a very clean gothic hand that is more legible than most, and extremely delicate whitework. 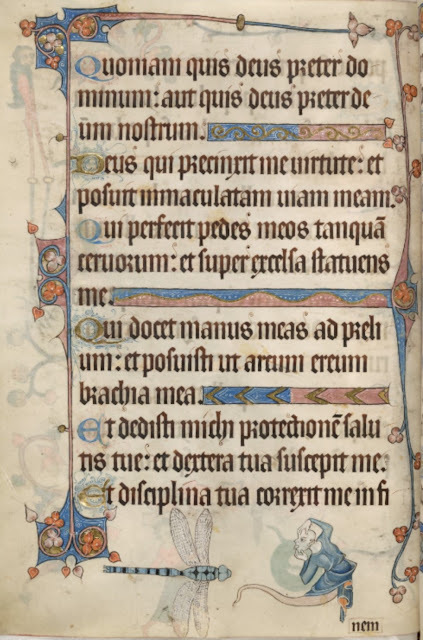 I ultimately selected folio 36v because of her love of dragonflies. Adrienne let me know in the past that she eventually would love a scroll on parchment, but I knew this was not the time. Rather than using paper, I chose to use Pergamenata to give it the look of parchment. I started by writing the words. I wanted to keep the same number of lines of text as the original, and fill the space in a similar way as the original. 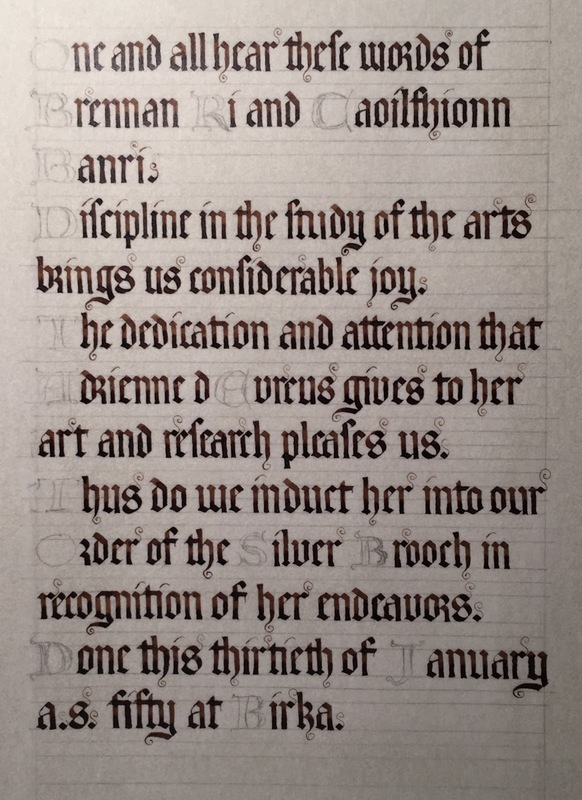 I even estimated the number minim strokes+spaces needed to fill each line. art and research pleases us. Words done, I started practicing to see what size nib I would need. My line spacing was set to match a printout of the original, so I needed to find the right pen to match. I ended up choosing a Mitchell #3.5. A fairly large nib compared to what I usually use, but it gave the right weight. 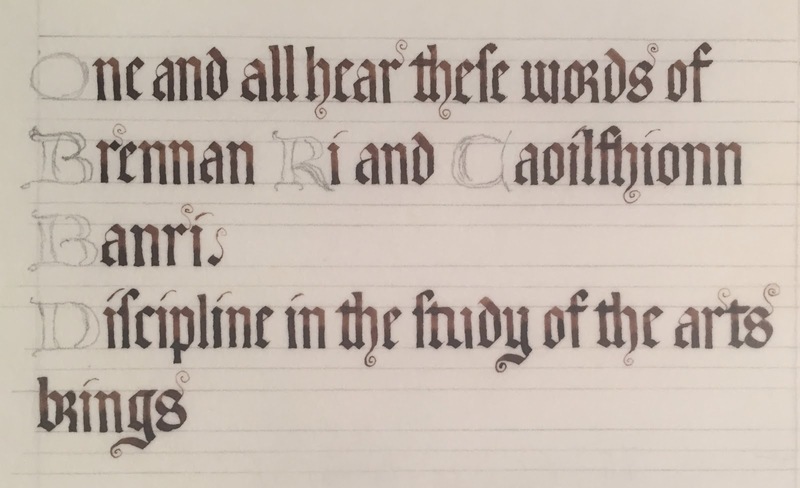 That short practice out of the way, I lined the page and started on the finished text. The little curlycue flourishes and flat feet were drawn by pulling wet ink with the corner of the nib. I drew in the capital letters as I went to ensure I left enough space for them. 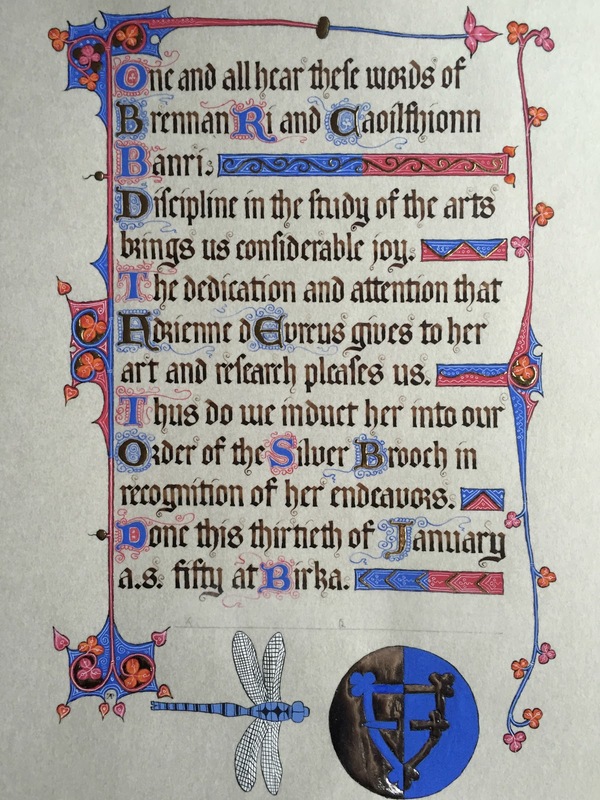 In relatively short order, I completed the calligraphy. This is not a fast hand to pen, but there were very few words. Using a light box, I traced the border from the original in pencil. Then I drew in the ink outlines using a pointed nib and Ian's Iron Gall ink. I replaced the grotesque from the original with the symbol for the Silver Brooch. Then it was time for the Miniatum. Miniatum is a modern alternative to gesso that provides a raised surface for gilding. I used it colored with a few drops of yellow ink, and thinned with water. I get best results when I paint on 4 or 5 thin layers, and let it dry 12+ hours between coats. Gilding large areas on Pergamenata is really difficult. The Miniatum goes on better if it's wet, but then the pergamenata buckles. I kept the page completely taped down to a drafting board while I worked to help keep it from curling too much. Once all the coats of Miniatum had been applied, I waited 6 hours after the last coat and gilded. The symbol of the order is silver & blue, so I used Palladium leaf on it, and real gold leaf on the rest of the page. Then it was time to add colors. First step, mix the colors to try to match the original. It's hard to tell in the pictures, but the border is a pinkish red and lighter than usual blue, while the leaves alternate between the same pinkish-red and an orange-red. The leaves are highlighted with lighter colors to help them pop as well. Once I was happy with the colors, I started painting. Blue first. Then the red and orange. Then the lighter highlighting on the leaves. 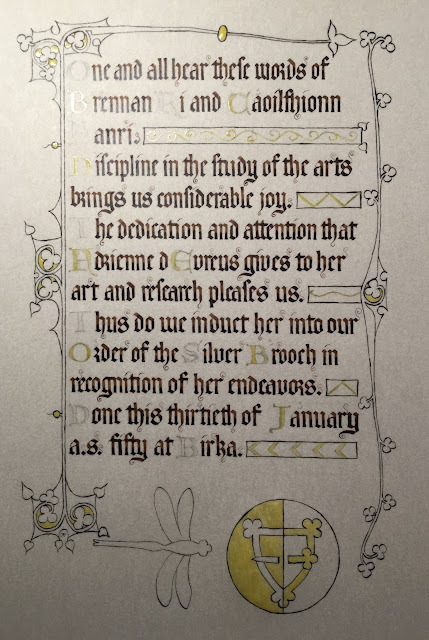 The whitework is a bit hard to see in the pictures, as it's extremely delicate in an attempt to match the style of the original as closely as possible. Here's a close up of one area. For reference the height of the letters in "us" is a quarter of an inch, or 7mm. Finally, I added the filigree around the capital letters using the same paint from a pointed nib, and painted the rest of the dragonfly.